Meditation is great, and great for you! If you’re working on your recovery, this timeless practice can help you to stay mindful of your feelings and emotions, and can keep you focused on a healthy path. Although for some, meditation may seem “new age” or “out there,” it’s actually a practice that has existed for thousands of years, and which is a part of the everyday lives of people of all ages, lifestyles, and backgrounds. It can be quite challenging in some ways, and as a result, some people are tempted to quit before they’ve hardly even started, but stick with it, and meditation can truly change your life. Mediation has been a part of most religions, in one way or another, since their beginnings – but, depending on the religion, it may not be called exactly that. Truly, prayer is a type of meditation, as are most forms of quiet contemplation and reflection. In its simplest form, meditation is simply a targeted, directed, sustained focus on, well, something. When used in a religious setting, as it has been for thousands of years, that focus could be a higher power, or the words of a prayer. More recently, though, mediation has gained much popularity in the secular world, and the focus in a non-religious setting today is often the breath of the practitioner, a self-guided visualization, a phrase, a focal point, or sound. The point of meditation is not to clear your mind and make it blank (although that is a common misconception about it), but instead to deeply focus on one particular thing. One-pointedness, perhaps, would be the best and most descriptive name for it. Honestly, with that in mind, meditation may sound easy, but it is not. It is certainly simple in concept, but beginners will quickly find that staying completely focused on one thing for more than a few seconds – even in a darkened, silent room with their eyes closed – is nearly impossible. That’s why meditation is a practice, specifically; anyone who meditates, no matter how long they have been doing it, is merely practicing, and trying to improve. Even people who are considered meditation masters struggle with focus, and are constantly reminding themselves to return to the breath, or to whatever else they have chosen as their focus during that session. Although in time, a practitioner may improve, it’s not something that one can perfect, and that’s why it’s a practice. The process is the goal. Meditation has many benefits, and while many are reported anecdotally, others have actually been proven though scientific research and studies. Anyone who meditates on a regular basis will report feeling calmer and more serene overall, more focused thought in everyday life, and having an overall general awareness and mindfulness regarding the world around them. People who meditate are often more self aware and more patient in their dealings with others. Once you have developed a regular meditation practice, you may find that you are less frustrated by simple things like standing in line at the store, and you may see that you have become a better listener and a more empathetic friend and human, too. As you might imagine, hundreds if not thousands of scientific studies have been conducted regarding mediation, and the results are quite exciting. One very in-depth and thorough study by the National Center for Complementary and Integrative Health found that meditation can lower blood pressure, can help control anxiety levels, can assist in reducing depressive symptoms, and can aid in improving quality of sleep. That same study suggested further that meditation can slow or even reverse age-related changes in the brain, and can, over time, create positive changes in brain structure and functioning. Furthermore, other studies about meditation have suggested that meditation can help enhance our immune system, thereby helping us to fight off infection and illness, decrease our subjective pain ratings, and help to speed up our information processing, improve our decision making, and assist with memory formation (Note 2). It’s really amazing and inspiring to see all the benefits of meditation, and each of these is certainly motivation to make it a regular part of our lives. 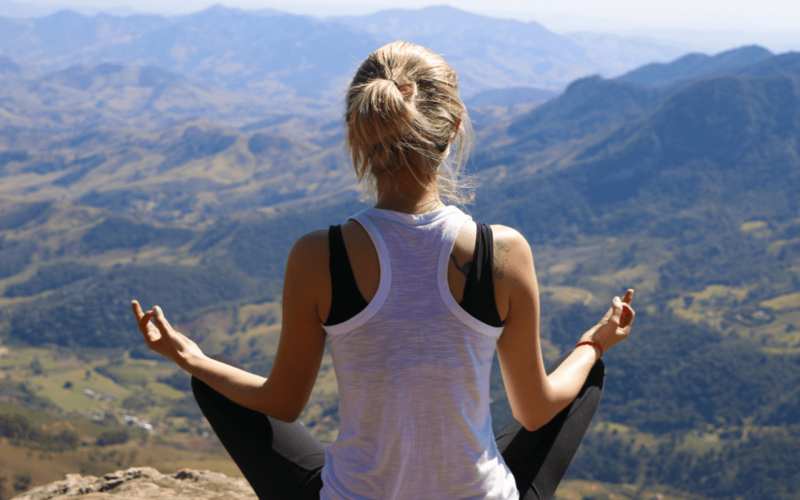 If the above facts and findings are not enough to encourage you to get started right away, perhaps the direct benefits of meditation to individuals in recovery will help. Clearly, most if not all of the benefits listed above can and will help you on your recovery journey, but there are further additional benefits that apply to people recovering from drug or alcohol addiction specifically. First of all, meditation can help to level out mood swings – a common obstacle for those who have recently quit abusing harmful substances – and can help you learn to react to these variances in your moods in a healthy and productive way. The mindfulness inspired by meditation can help recovering addicts to observe cravings and be with them, but not be carried away by them, and can help you notice signs of a relapse before it happens, and get yourself on a healthier trajectory. Furthermore, meditation practice can help you learn to get pleasure from simple thing – something you may have unfortunately forgotten how to do while deeply involved in your addictive behaviors. Also, it can help you to properly manage your interpersonal relationships with others, thereby keeping your immediate environment stable, positive and happy. Mediation doesn’t cost anything, and it is always available to you – anywhere, anytime, day or night – and it is a tool that can greatly help you on your path to a healthier and happier life. Getting started with mediation is easy, and there are many tools available to you. A simple online search will provide you with a wealth of resources. In it’s most simple form, you can start meditating right now by finding a quiet place, free of outside distractions, and sit or lie down comfortably. Focus on your breathing, keep an open mind, and don’t give up. Every time your mind wanders, simply return your focus to your breath. Don’t get angry with yourself for letting thoughts arise; this happens to everyone. Just return to the breath, each and every time, again, and again, and again. For your first few sessions, keep it short; a few minutes here and there throughout the day can be extremely effective, and you don’t want to sit too long and get overly frustrated. In time, the length of your meditation sessions can increase, and remember, daily consistency is more important than length, especially in the beginning. As you get more into mediation, there are a wide variety of types you can try. The breathing method described above is probably the most common, but it is really just a start. Mantra-based mediation focuses on a phrase or sound chanted aloud or silently to oneself. Progressive muscle relaxation involves focus on each body part in order, helping you to become more physically relaxed overall. Guided mediation can include an individual – live or recorded – leading practitioners through a meditative visualization that can take them more easily into a deeply focused state. Also, you don’t have to sit still to meditate, meditation in motion can be achieved through focused walking, eating, or through another discipline such as yoga. There are many books and websites dedicated to mediation and many of them offer tips and in some cases pre-recorded, guided meditations that can be very helpful. In almost every community, there are mediation groups that meet weekly or more that would love to welcome you. Also, there are two phone apps that are great for beginner or even seasoned meditators – Headspace, which includes instruction as well as a wide variety of guided meditations of all kinds, and Insight Timer, which also has guided meditations but also a great free timer and a community for discussion as well. All of these resources make it easy for anyone to get started with meditation, so there’s absolutely no reason to hesitate – go ahead and get started today! The benefits are nearly endless and there is no reason not to make meditation a part of your life, now, and onward into the future.